Mayflay Offers a complete range of Hydraulic Heavy Duty Decoiler Machine for decoiling of coil material, which covers nearly any possible demand. Hydraulic Heavy Duty Decoiler Machine, depending on customer's request, are built for material widths from a few mm up to maximum width of about 1800 mm. Standard versions are available for max load starting from 300 kg up to 10000 kg. Bigger load capacities, up to 20000 kg, also can be offered after clarification of details of customer's request. Hydraulic Heavy Duty Decoiler Machine, depending on customer's request and on size, are available with manual or hydraulical expansion. They can be delivered as payoff decoilers without drive or as driven decoilers with start and stop drive or with variable speed drive. Step-2: Straightener machine, Straightening the strips. 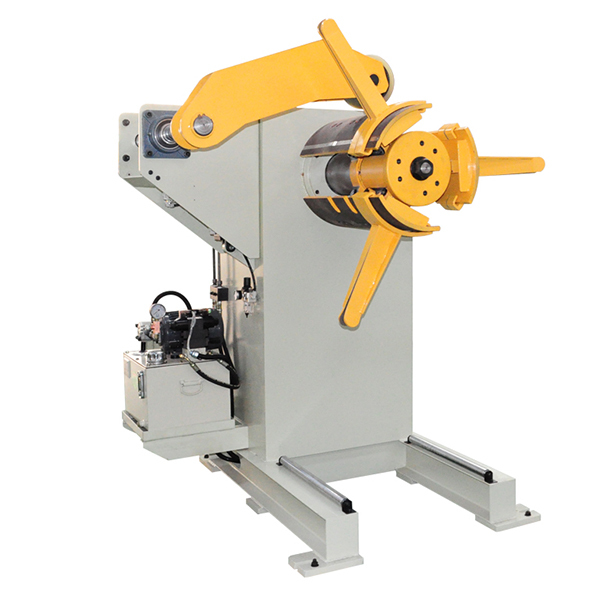 Step-3: NC Servo Roll Feeder Machine, Feed coil strips to press machine. Step-4: Power Press Machine with the moulds,pressing to the end product. Looking for ideal Big Heavy Uncoiler MachineHydraulic Manufacturer & supplier ? We have a wide selection at great prices to help you get creative. All the Hydraulic Decoiler Machine For Sheet Metal are quality guaranteed. We are China Origin Factory of Heavy Load Hydraulic Uncoiler Machine. If you have any question, please feel free to contact us.